Oameal Snickerdoodles | wanna come with? 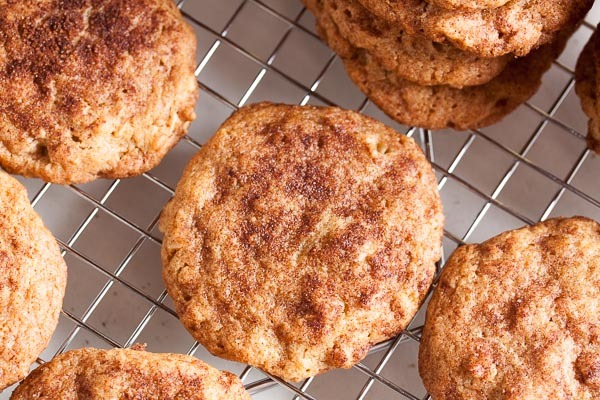 I’d never tried a snickerdoodle (or even heard of them, honestly) until I made them myself last year. Everyone loved them, including me, and I’ve been looking forward to trying more versions of the recipe ever since. 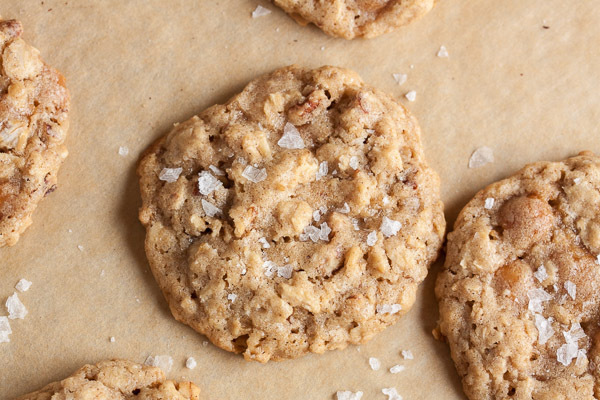 What’s not to love about a cinnamon sugar cookie? 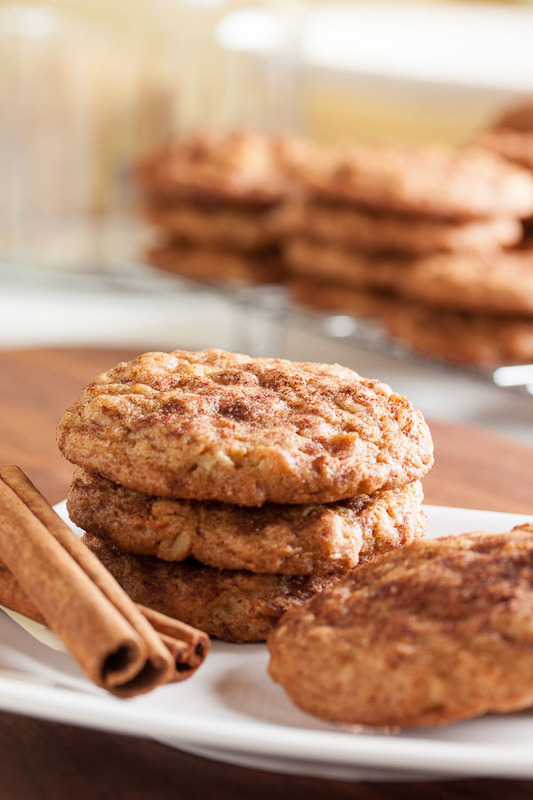 When I found this oatmeal snickerdoodle recipe it sounded like the perfect combination – cinnamon oatmeal cookies. Yum! I was at the bookstore a while ago and saw a single copy of Maida Heatter’s Cookies tucked in the middle of all the other baking books. Given how many baking cookbooks I have, I was shocked to realize that I didn’t have a single one of her books. A gross oversight on my part, obviously. There’s a huge range of types of cookies in this book, and I had a hard time choosing. 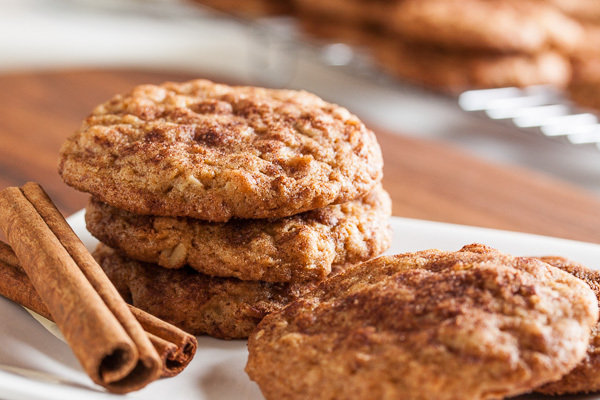 But then Oatmeal Snickerdoodles sounded like a good fall cookie. And of course, this is where I hit a snag. All of the ingredients made perfect sense and were pretty standard cookie fare – 2 cups flour, 1 cup butter, 2 eggs, etc. – until I got to the last ingredient. Ten cups of oatmeal. TEN. Obviously that had to be a typo. I searched online for this recipe, and with a little help found someone who’d baked these cookies from one of Maida’s other cookbooks. Other than the quantity of oatmeal (now a much more reasonable 1-1/2 cups), it’s exactly the same recipe. So I went with that. Only the second recipe I’ve tried from this book and already a typo? Not an auspicious beginning, I’ve got to say. Most of the reviews for this book on Amazon are very positive, though, so maybe I just got unlucky and chose the one bad recipe of the bunch. We’ll see. The first cookie I made was amazing, so I’m certainly not giving up hope on this book. Once I got that ingredient issue sorted, the recipe came together very nicely. 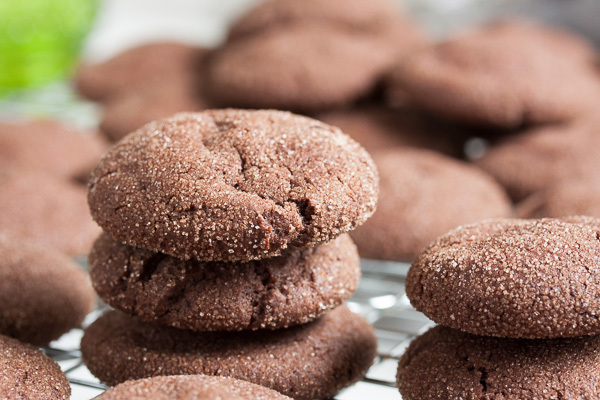 I was a bit concerned to see the temperature is listed as a whopping 400°F, but I think that high temperature almost caramelizes the sugar coating – the cookies get quite dark once baked, unlike a traditional snickerdoodle which stays a lovely golden colour. 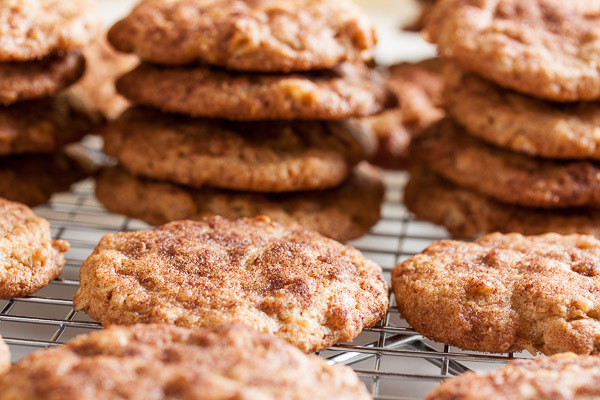 They’re soft, and the oatmeal gives them both a chewy texture and oat-y flavour, which is coupled with a nice cinnamon flavour from the coating. It’s nothing fancy, but a lovely cinnamon oatmeal cookie. The type of cookie you want to fill your cookie jar with. The recipe stated to just place rounded teaspoonfuls of dough on the baking sheet and sprinkle with the sugar-cinnamon mixture. I did my first tray that way, and while they spread out just fine, the cinnamon was limited to a small area in the center of the cookie. For the rest of them, I flattened the cookies slightly before sprinkling with the cinnamon – this way the cinnamon covered more of the surface of the cookie. Definitely the way to go! The other thing I modified slightly in this recipe is that I opted to mix the oats in with the dry ingredients, rather than adding them separately after mixing the dough. I could see no reason to do it that way, and combining them with the rest of the dry ingredients helps ensure they’re distributed evenly, and also helps avoid overworking the dough. Adapted from Maida Heatter's Cookies. The recipe states it makes 54 cookies measured by rounded teaspoons; I got 50 when I used my usual tablespoon-sized cookie scoop. In a medium bowl, whisk together the flour, oats, baking soda, cinnamon, and salt. Set aside. Turn the mixer down to low and add the dry ingredients, mixing until just combined. 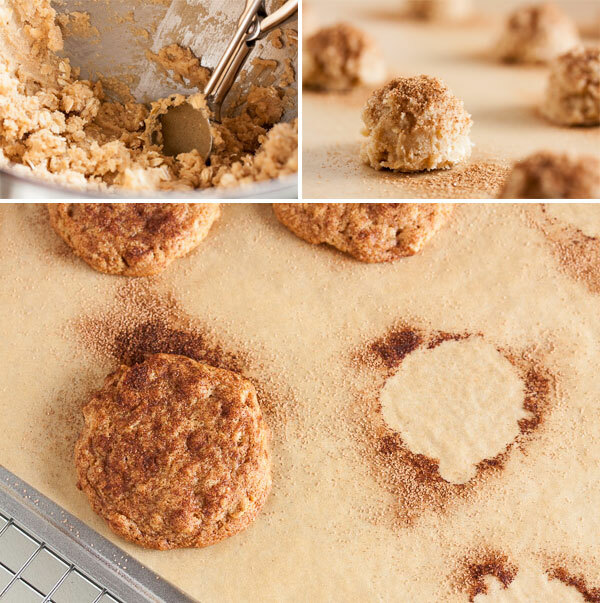 Using a small cookie dough scoop or rounded teaspoons, portion the dough onto the baking sheets about 2 inches apart to allow for spreading. Press down slightly with the palm of your hand. Using a small spoon, sprinkle a generous amount of the cinnamon-sugar mixture over the top of each cookie. I used quite a bit and still only ended up using about half of the mixture, so it's probably safe to make a smaller amount if you want. Bake for about 10-12 minutes, until lightly browned all over, rotating the baking sheet halfway through. Allow to cool on a wire rack for a few minutes before removing the cookies from the pan and allowing them to cool completely. Of COURSE you bought another cookie cookbook! You must be easy to shop for for Christmas. 😉 And I totally agree, no pictures are almost a deal-breaker for me. I even get skittish if only some of the recipes have pictures! 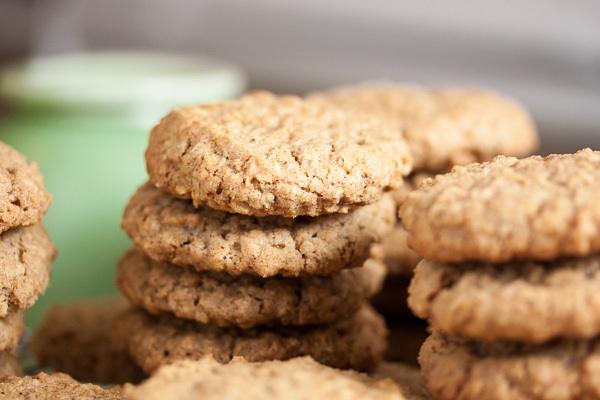 These cookies sound awesome–adding oats seems like a great idea for a snickerdoodle! Those look so delicious! The recipe makes a BUNCH! Looking forward to trying. Thanks for posting! 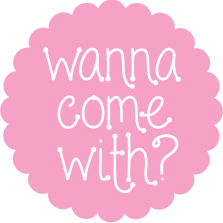 I like to post recipes on my blog, but definitely don’t have as many cookbooks as you! Lol. I do like buying them though. I have some Paula Dean cookbooks that I don’t regret buying, as well as some of my husbands grandma’s cookbooks from the 1930’s! Thanks again for posting.